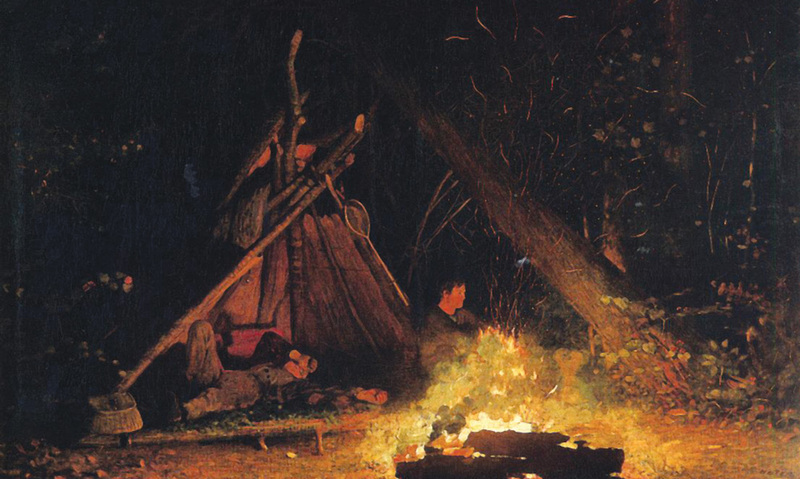 The Camp Fire, c. 1880, oil on canvas by American artist Winslow Homer (1836–1910). Image courtesy of The Athenaeum. In the spring and early summer of 1892 The New York Tribune published fourteen short works by a twenty-year-old author named Stephen Crane. Set in the Catskill Mountains of New York’s Sullivan County, these comic tales and slice-of-life pieces form the core of what have become known as the Sullivan County Sketches. The more journalistic articles are about hunting, backwoods living, and Native American lore. The five selections most often identified as fiction feature four unnamed men, identified simply as pudgy, little, tall, and quiet and corresponding loosely to Crane’s group of friends, with Crane himself claiming the role of the little man—or perhaps, other readers contend, the quiet one. Two additional stories about these four men appeared later that year in other periodicals, and three remained unpublished until after his death eight years later. Crane began writing these tales and sketches while camping with his friends in the Catskills, and he hesitantly showed a couple to Tribune editor Willis Fletcher Johnson, a family friend who heard about them at some point from Stephen’s brother Townley. Stephen had been working for several years as a stringer for Townley’s Asbury Park news bureau and he had already filed a number of unsigned pieces on local events for the Tribune—but he had not yet met his brother’s editor at the newspaper. Johnson was impressed by what he read, and Crane's sketches began appearing in the Tribune’s Sunday feature section. The first “fictional” tale was “Four Men in a Cave,” to which the editors added the subhead “LIKEWISE FOUR QUEENS, AND A SULLIVAN COUNTY HERMIT.” And so “Four Men in a Cave” can rightfully claim the place of being Stephen Crane’s first published short story. It was not reprinted during Crane’s lifetime, although Cora Crane (his “common-law” widow) selected it as the only Tribune piece in the posthumous collection Last Words. The moon rested for a moment in the top of a tall pine on a hill. . . . If you don't see the full selection below, click here (PDF) or click here (Google Docs) to read it—free!